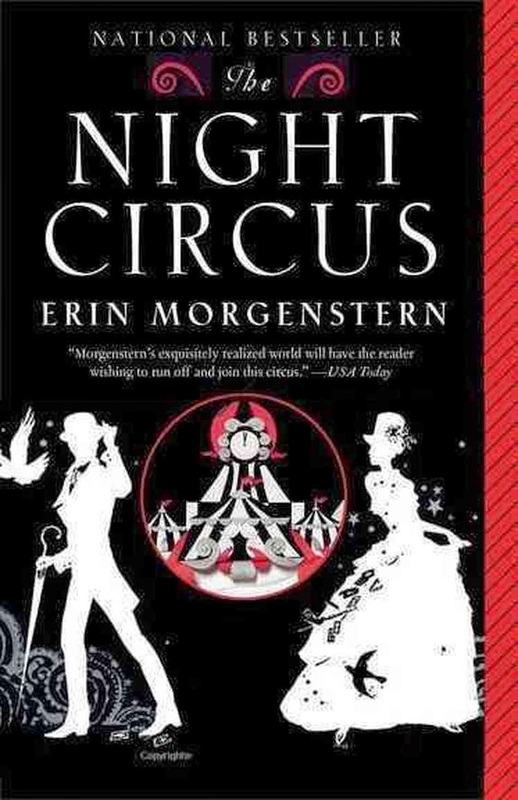 I have to say, I don't know where to begin with The Night Circus. There was so much going on, so many sub stories, so many details, so many things to keep track of... yet I found that it was hard to preoccupy myself with trying to keep things straight. Maybe you could say that Erin Morgenstern's magic worked on me. From the first page, I was completely swept up, totally on board. I love this first mysterious line of the book. And from there, the tale of Le Cirque des Reves, a battle ground devoid of any color other than black, white, and grey, comes when darkness falls each day. For the first 300 pages you are entertained by extravagant, mysterious, and magical details. You hardly realize that you have come the length of most novels without really getting down to the point of the story. What we learn: Marco and Celia are two magicians being trained by their instructors, in two different schools of thought, to compete against each other in a battle where there are no clear rules. Readers follow Marco and Celia's training, the development of Le Cirque des Reves from its conception, and the stories of several other characters that contribute to the circus in some way. At the bare bones of it, this story is about two star crossed lovers, fighting in a battle where only one is left standing. They are bound to the battle, bound to the circus, bound to each other. All the spaces in-between this plot are stuffed with magical intricacies. Honestly, I was delighted. But after that point, something ominous starts to settle over the reading, and the real plot comes into action. I have to admit that this jolted me out of my reverie and the impending 200 more pages felt a little more like work to get through. Don't get me wrong, I still loved it, but it was hard to start trying to concentrate more deeply after I'd gotten used to sailing down this stream of magic. The story was a juggling act in itself, with so many people to follow. Often, when this happens in novels, I find myself bored with certain characters and hate plodding through their perspective when their voice takes precedence. But I enjoyed each character so much, that I read through each perspective with high interest and ease. The funniest thing about this is that despite her details, there is little character development going on. Even for the two protagonists, Marco and Celia. The true main character of this book is the circus venue, because we learn about it with intimacy. I also liked how Morgenstern doesn't necessarily make the ending a completely happy one. Or maybe it is, depending on your viewpoint. She made the rules complicated, and she didn't throw in any unbelievable twists to resolve them in a way that didn't feel fluid with the story. "...It's in the listener, and for each and every ear it will be different, and it will affect them in ways they can never predict. From the mundane to the profound. You may tell a tale that takes up residence in someone's soul, becomes their blood and self and purpose. That tale will move them and drive them and who knows what they might do because of it, because of your words... there are many kinds of magic, after all." I feel like Morgenstern closes her book with encouragement to anyone reading, to make magic in their own lives—to dare to be passionate with their talents and interests. Certainly her debut novel stirred up some motivation for me. The Night Circus serves up an apple cider that is delicious beyond compare. I recommend drinking apple cider with this book, even though ours will never taste as divine. In the end, like the reveurs in the story, it may leave you will true longing to experience the circus for real.